For four generations we’ve been making willow baskets in our workshops in Somerset without fuss or haste and with a passion that could only be described as obsessive. 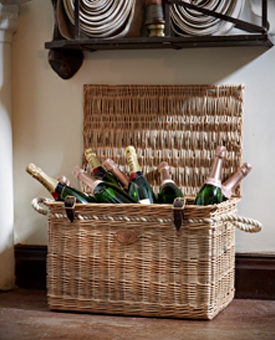 Our substantial range of willow basket and wicker articles for the home and outdoors encapsulates and fulfills a multitude of uses from the home and garden to the country pursuit and weekend getaway. Each of our willow baskets is made to a specific and exacting specification which is clearly displayed on the product information area for each of our willow baskets. Customers should allow a +/- 1.5cm tolerance on sizes given, this is because every basket is character fully and ornately hand worked with no two baskets being the same. Our willow baskets can be fitted with leather, hide and metal fixings and where applicable these are sourced from premium merchants ensuring the highest quality. For more information on our range of willow baskets please visit our Home and Interiors Collection here you will be able to browse a fine selection of our willow baskets for the home and outdoors. If you are looking for firewood carriers and containers you can take a look at our exclusive range of log baskets by visiting our Fireside Range.